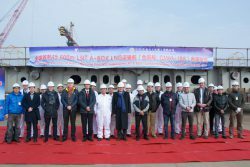 Haimen-based shipbuilder China Merchants Heavy Industry (Jiangsu) Co. Ltd. held the keel laying ceremony this past Tuesday for a midsized LNG carrier, hull numbered CMHI-188, featuring the LNT A-BOX® containment system. The 45,000 cbm carrier is the first of two such vessels ordered in late 2015 by Saga LNG Shipping aimed at bringing new life to the dwindling midsized LNGC fleet. Set to be delivered the 1st quarter of next year, the vessel will be the first LNGC to feature an IMO Type A LNG containment system developed by Norway’s LNG New Technologies (LNT). “Reaching today’s milestone commemorates a significant achievement for Saga LNG, CMHI and all of our partners in this endeavor. As production reaches full swing, we are starting to see first-hand the results of many years of hard work and we shift our focus now executing the project with the highest safety and quality standards. We continue to believe that when she is delivered, our vessel will give the industry much needed flexibility in vessel size and will present the opportunity for new business models for LNG transport.” said Jonathan Verswijver, VP Business Development, Saga LNG Shipping. Based around the LNT A-BOX® technology, Saga LNG shipping aims to build, own and operate a series of tailor-made small and midsized LNG assets targeted at projects currently in various stages of development. Types of assets included in Saga LNG’s scope are LNGCs, FSUs, FSRUs, and LNG Bunker Vessels, all within the 1,000 to 100,000 cubic meter range.